There have already been quite a few discussions about bibs here on Babyccino, and Esther has already revealed that the two of us are slightly obsessed (or nerdy, whichever you prefer). All that aside, here is a bib that blows all other bibs out of the water: the Bavetton Original. It’s a bib and also a tablecloth. 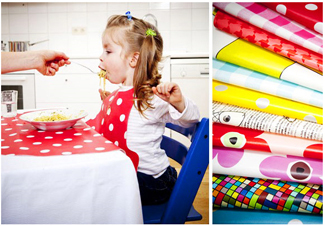 It allows your messy little eater to eat as he/she pleases without spilling on the floor or making a mess of the table. With two snap fasteners, the Bavetton bib creates a pocket between the child and the table, collecting all sorts of wonderful surprises! The bib (created by a mom, of course) is a wipe-clean material and is light-weight and easy to roll up and take with you wherever you go. And, it comes in loads of cool colors — I have the fun multi-colored one. This ‘bib expert’ gives it two thumbs up! You can buy the Bavetton bib from SitOnDesign, or visit the website for other retailers. But probably not the best idea if your daughter likes to stand up and do a twirl mid dinner! Ha! Yes, wouldn’t be good. I think it’s probably best for the kids seated in a highchair! Probably best for the kids aged 1-2, when they’re eating on their own and making quite a mess.